Outdoor kitchens can be a valuable asset to your backyard and your patio experience. Designed to provide a complete cooking experience without having to step indoors, a fully loaded outdoor kitchen can cost a lot of money. On the other hand, they can be properly built on a budget as well. The first thing to consider when building an enclosure for an outdoor kitchen with a built-in grill, is the gas grill. This is the heart of the structure. A good built-in will last for many years, be repairable if necessary, and simply be a great grill. 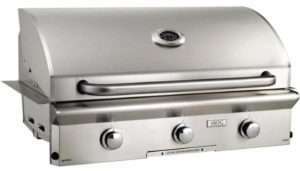 The products I have listed on this list are diverse in appearance and construction, but are great grills and will last. Even though these are relatively inexpensive, I do not recommend buying the cheapest you can find. There are a number of bad built-in gas grills out there. Those are not listed here. If you don't see a model you are familiar with, there is a reason for that. 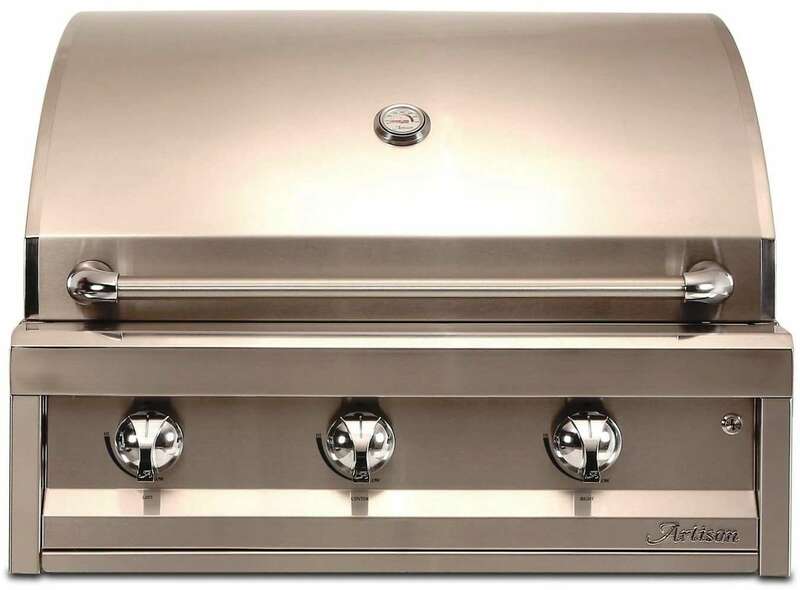 Designed, built, and backed by the same people that bring you the top of the line Fire Magic range of gas grills, American Outdoor Grill is the best of the 'discount' gas grill inserts. 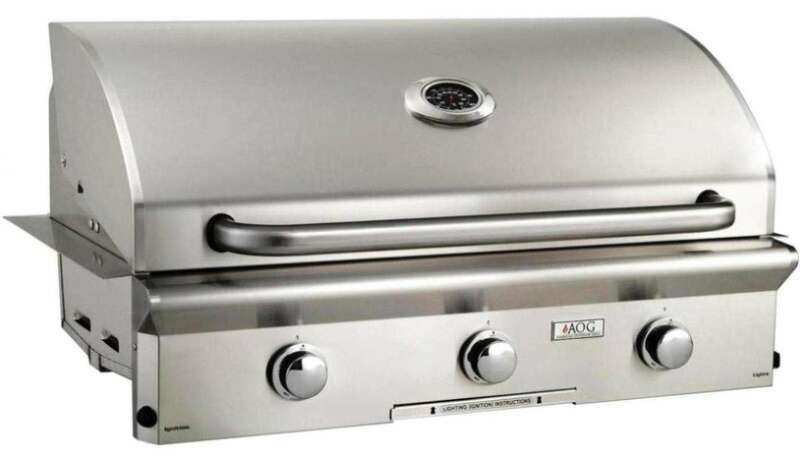 With complete 304 stainless steel construction, heavy cooking grates, and an elegant design, this is simply put, the best you are going to find under $2000USD for your built-in gas grill needs. The focus with this model is on the basics. The E-type stainless steel tubular burners produce an even heat under the 648 square inches of primary cooking surface. American Outdoor Grill is a complete line of outdoor kitchen products, so there are many ways to accessorize this grill. 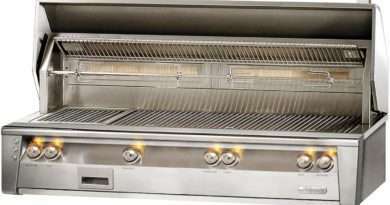 Alfresco is another of the top of the line gas grill makers. Their Artisan line is an affordable alternative that is produced completely of 304 stainless steel with welded and polished seams. 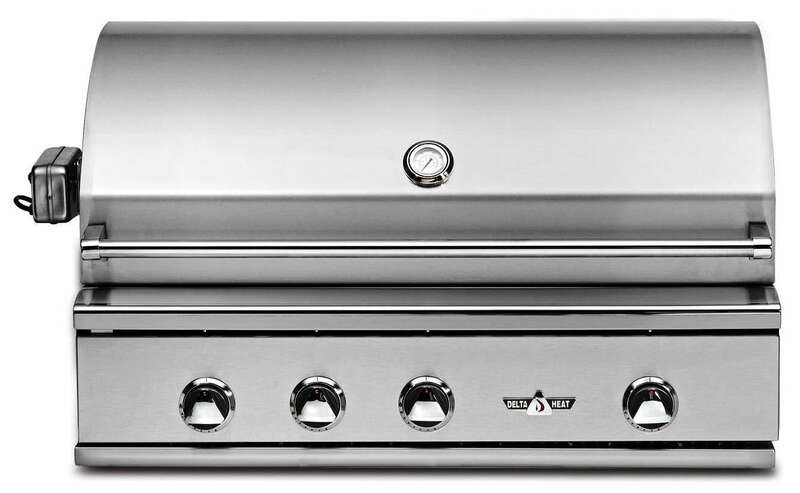 With 60,000 BTUs under 530 square inches of stainless steel grilling surface, this is a powerful grill. Like many of the products on this list, the Artisan is part of a complete outdoor kitchen appliance line and has many options. 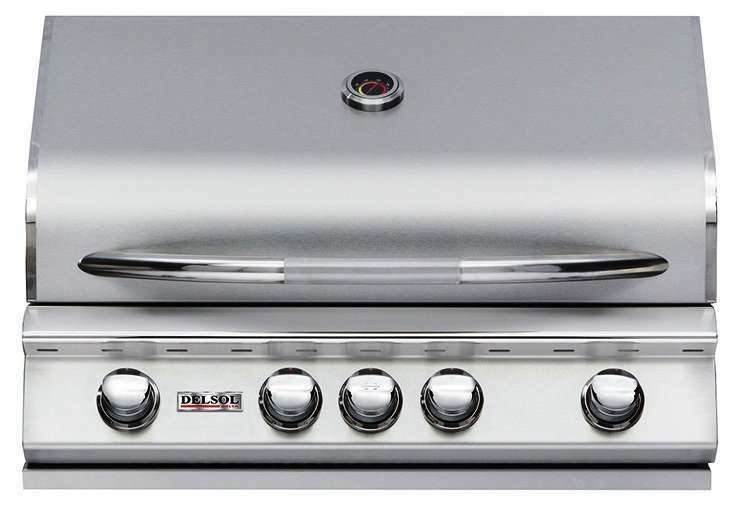 For $1,900USD you get a basic three burner gas grill, but a well made one that will last for a very long time. Yes, it looks very much like an old-fashioned gas grill, and it is, but it can be found for as little as $1,400USD and it will last a lifetime. 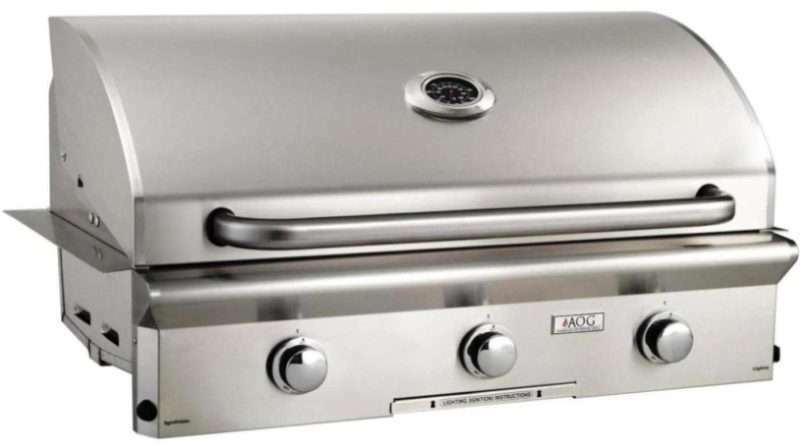 Modern Home Products (MHP) is one of the oldest gas grill manufacturers in the world, and this powerful, cast aluminum gas grill is one of their best. Built like a tank, this built-in may not be shiny, but it will probably never need to be replaced. 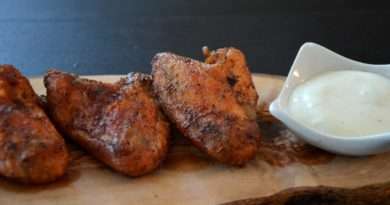 And while most of the gas grills on this list use stainless steel rod cooking grates, this grill uses something better. The adonized aluminum grates are not only durable but transfer heat better than steel and virtually eliminate flare-ups. For those more serious about performance than appearance, this is the best low-cost gas grill for a custom enclosure. 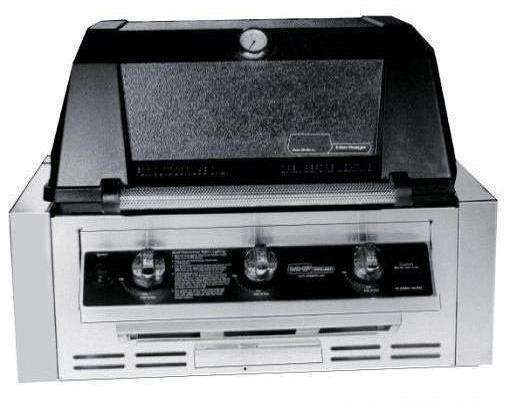 At about the same price as the MHP above, this model from Napoleon adds a rotisserie burner to the grilling experience. This makes this the best featured, low price gas grill on the list. Of course, at 30-inches, this is also one of the smaller models. 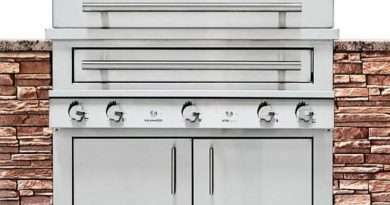 The 500 square inches of stainless steel grilling surface is heated by four burners pumping out as much as 48,000 BTUs. One point though. While this grill comes with an infrared rear mounted rotisserie burner, it will cost an extra $100USD to get the rotisserie kit. 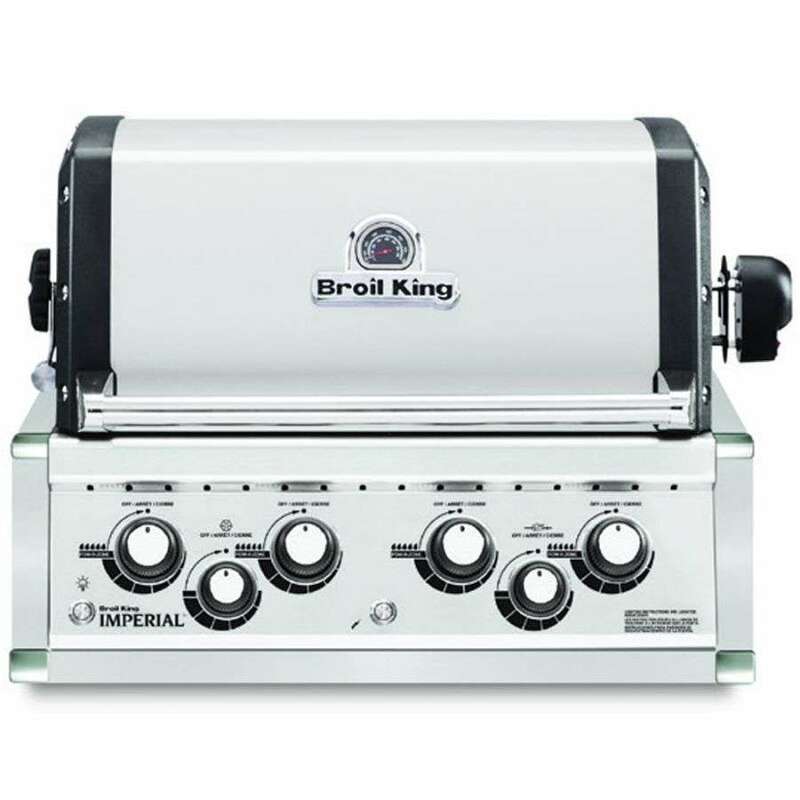 Another of the classic gas grills, the Broilmaster is considered bulletproof in the industry. The cast aluminum shell won't rust and can last for decades. The ceramic barrier actually converts much of the heat to infrared and prevents flare-ups (and you just flip them over to clean them). The stainless steel cooking grates can be turned over or around to adjust the distance between the food and the fire, adding a whole new level of versatility. 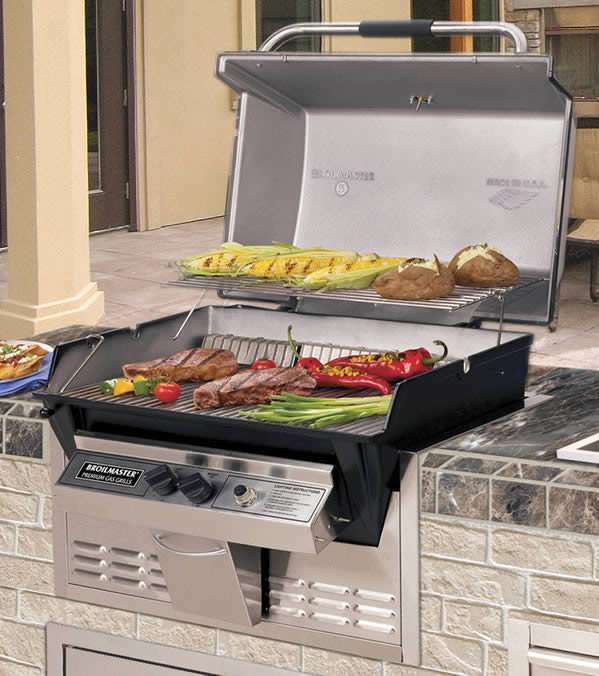 While this grill isn't part of a large line of outdoor kitchen products, they do have an optional side burner and cabinet doors. For the serious griller who wants a great gas grill for well under $2,000USD, this is a fantastic option. This is a small gas grill. For those not interested in grilling large amounts of food it is a good choice. It is, however, a complete infrared gas grill that can reach temperatures that most gas grills can't get close to. The construction of this model is excellent, and the company that makes it (Rasmussen Iron Works) has been in the business for decades. While this built-in unit might not be large, it is powerful and therefore it might just be a great accessory grill, used for searing and intense grilling while another gas grill can be used for other cooking tasks. This is something of a rare option. 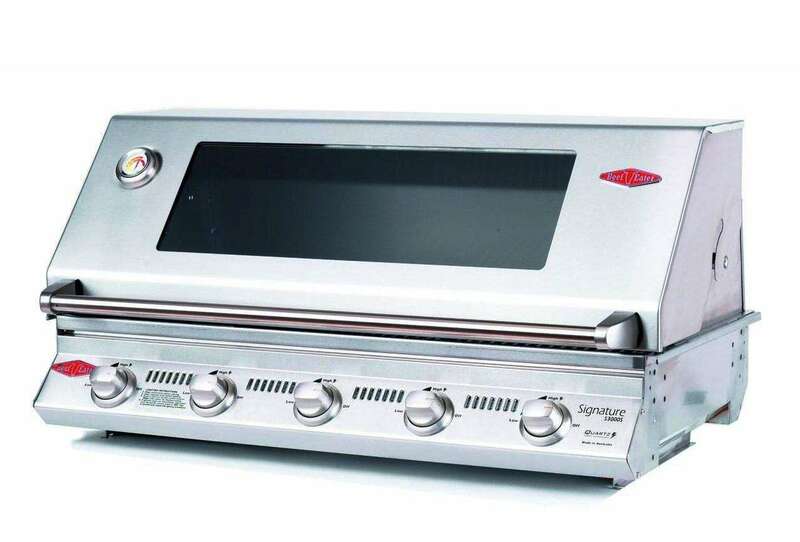 While limited in availability, this powerful and excellently equipped model from Broil King can be had as a built-in unit. Known much more for their cart mounted, traditional gas grills, this model boasts a full rotisserie system with rear mounted burner and a separate side burner (controlled from the main body of this grill). As a complete grill package, this is a good deal at well under $2,000USD. It is a limited edition product and will most likely need to be special ordered. 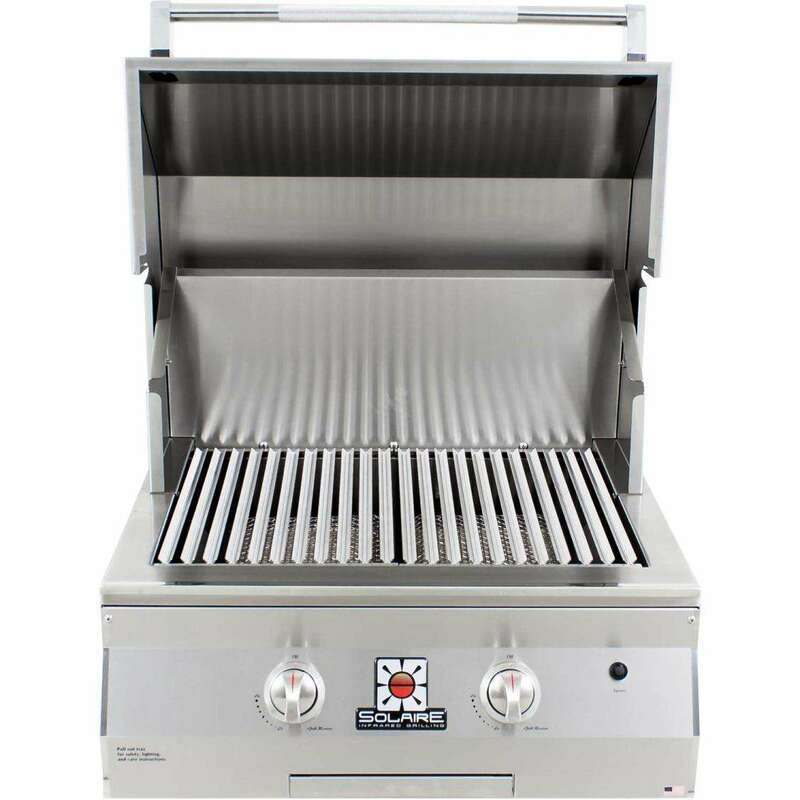 As one of the largest gas grills on this list, the Beefeater offers a lot of space, a glass window in the lid for viewing without opening and good construction. Beefeater is one of the big Australian gas grill companies and while availability can be spotty, they can be had online with confidence. This model features both open stainless steel cooking grates and a stainless steel griddle section. Also, the hood can be completely removed for open grilling from any direction. There are two infrared gas grills on this list and they are both about the same price. This model from Saber is more than twice the size. The difference is in the type of infrared technology they use. While the Solaire above can hit temperatures of nearly 1,000 degrees F, this Saber model will get to about 700 degrees. 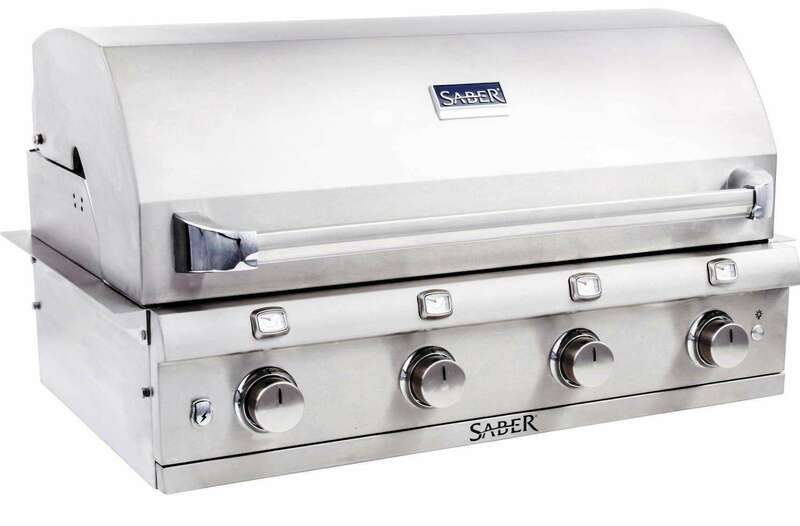 This Saber Gas Grill has complete 304 stainless steel construction and a nearly foolproof grilling system that doesn't flare-up and cooks evenly. On the other hand, it isn't the powerhouse that the Solaire above is. 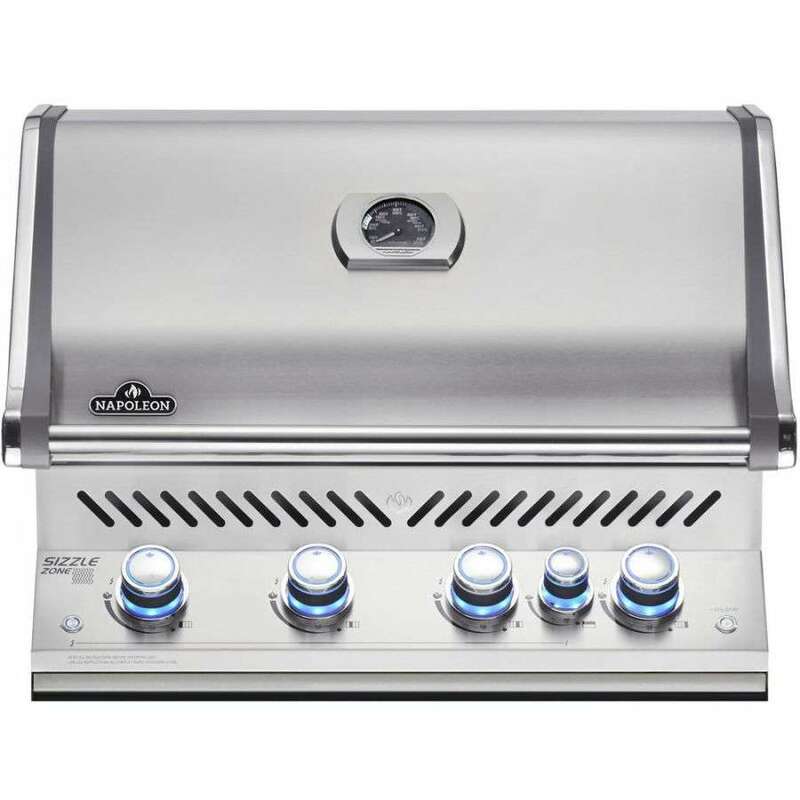 Consider this grill much more like a standard unit that grills well and has a number of great options and comes as part of a complete line of outdoor kitchen appliances. Twin Eagles is one of the best gas grill manufacturers in the world. Delsol is their inexpensive, imported product. It contains all the same amazing design of its higher-end cousins (they also make the excellent Delta Heat line) but at a discount price. 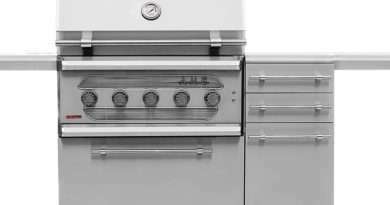 Constructed of 304 stainless steel, this is a good model to consider when building an outdoor kitchen and like most of the products on this list, it is part of a complete line of outdoor appliances. Find all the Best Built-in Gas Grills in every price range. Research before you shop to get the right Gas Grill for your Outdoor Kitchen.